Weight gain is a common symptom of menopause. There are many reasons for this, and the consequences can be quite negative. This article works as a guide to inform women of everything they need to know about menopausal weight gain, from the causes and risks to what can be done to combat it. What Causes Menopausal Weight Gain? During menopause, estrogen levels are declining. However, this decline is unfortunately not constant; before production levels out to a consistent low, there is a period when the body produces the hormone erratically, leading to estrogen fluctuations. One of the side effects of this hormonal imbalance is that fat is distributed within the body differently - it tends to settle in the upper body rather than in the hip and thigh area. 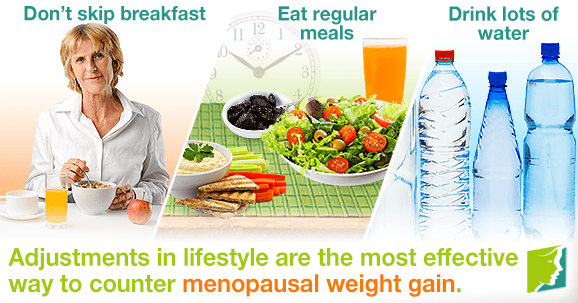 However, menopausal weight gain cannot be completely attributed to hormones. As we get older, there is a natural decline in muscle mass and metabolism rate. Less muscle means more fat, and the slower metabolism results in weight gain if dietary habits are not changed. Furthermore, a more inactive way of life becomes more likely with age, and this lack of exercise mean that calories are not being burned and therefore are stored as fat. This time of life can also coincide with stressful events, such as dealing with with aging parents, grieving the death of a friend, or children leaving home. One of the consequences of stress is often weight gain. Although menopausal weight gain can be unpleasant for a woman to deal with, there are also much more serious risks involved with being overweight. Below is a list of some of the negative consequences of weight gain. The negative self-perception that some women have after suffering from menopausal weight gain can lead to feelings of anxiety or depression, and if these develop into clinical conditions, everyday life can be adversely affected. High blood pressure can be a symptom of menopausal weight gain because the heart needs to pump harder in order to supply blood to all the cells. Surplus fat also damages kidneys, which help control blood pressure. Cells change their activity as a result of too much weight, which can sometimes make them resilient to the hormone insulin. Insulin's function is to carry sugar from blood to the cells, but with insulin resistance, blood sugar cannot be taken up by the cells, resulting in high blood sugar and possibly diabetes. How Do I Combat it? A common sense approach to eating should go some way towards combating menopausal weight gain. Read on for some tips on changing dietary habits. Skipping breakfast can encourage snacking, which can mean you are ingesting more calories than you are aware of. A healthy breakfast is full of fiber, protein, and vitamin C, which will all help maintain a feeling of fullness and also help preserve optimal health. Studies have shown that eating regularly throughout the day leads to calories being burned at a faster rate. Snacks between meals should not cause menopausal weight gain as long as they are healthy and nourishing. A good idea is to try and eat only when you are hungry and stop when you are full. Thirst can often be incorrectly interpreted as hunger, so people who are dehydrated are more likely to take in a higher amount of calories. It is recommended for an adult to drink the equivalent of 1.5 liters per day, although in hot weather or during exercise, more might be needed. Menopausal weight gain can be unpleasant and sometimes even dangerous, but it can be combated. Being aware of your own body's triggers and the circumstances that might be leading you to gaining weight is important, and means you are in a better position to make the right lifestyle choices to reduce your weight gain. Read all about menopause weight gain in addition to what you can do to slim down to a thinner you and maintain a healthy weight.